I´ve been overwhelmed by the details of the Spanish language, but positively inspired by the details of Spanish architecture. As I wrote in a previous post, legend has it that if you find the frog in the fasçade of the University entrance you will get married in a year. Single women flock to the entrance every morning to try and find it. I found it yesterday! Haha, sorry Mike. If you think it was an easy feat think again. 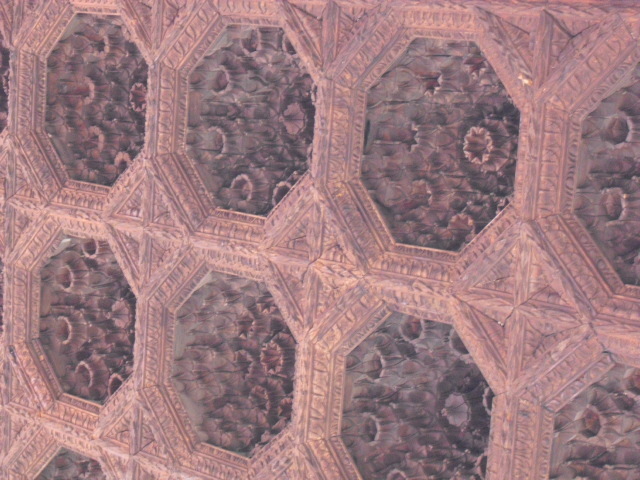 The whole wall is carved with intricate flowers, animals, and decorations. People stare at it for hours until their necks get sore. The frog is only about an inch tall and it´s high up. I should start a business where I charge desperate women a euro for each hint as to where the frog is. Here´s a funny side note. WordPress (the site that hosts my blog) shows me what links causes people to view my blog. 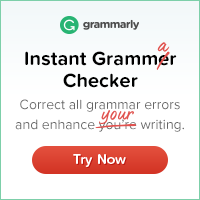 My post about the dreaded lisp is the most visited, and I was wondering why. I have a picture of Megan Fox at the bottom, and then I saw that hundreds of people viewed the post because of the Megan Fox tag! That´s one way of getting visitors! 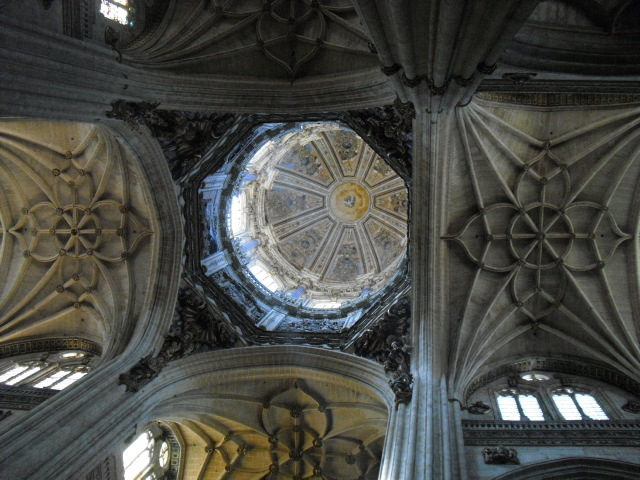 And now I will show you some pictures of the ceilings in Salamanca and Segovia. I´ve been blown away by the details. 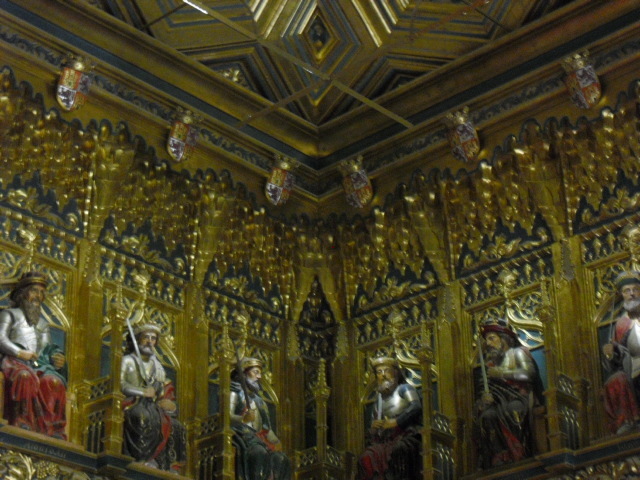 In the castle of Segovia. This was the meeting room. 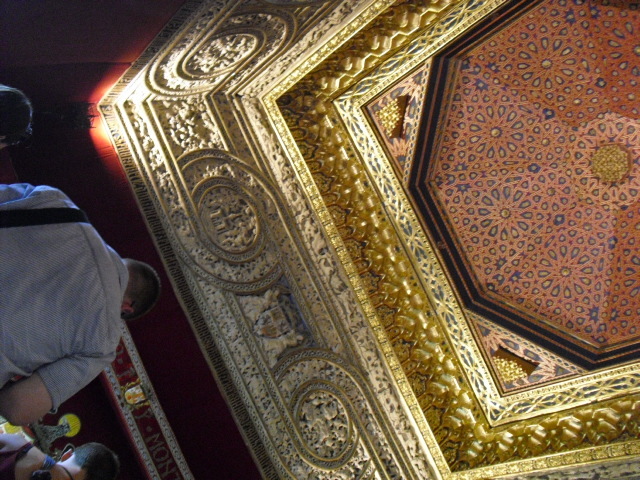 This ceiling is about 30 feet high and decorated with all the kings of Spain´s history. Below each one is a description of their rule and lineage. These figures are about 5 feet tall and about 20 feet above your head. 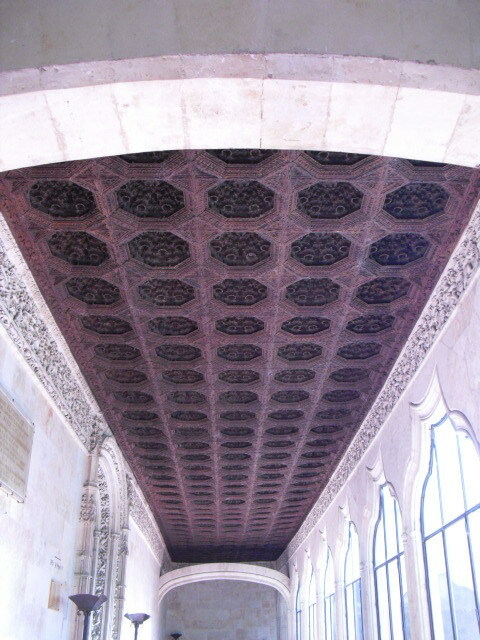 This ceiling is about 40 feet high. The walls are red velet. 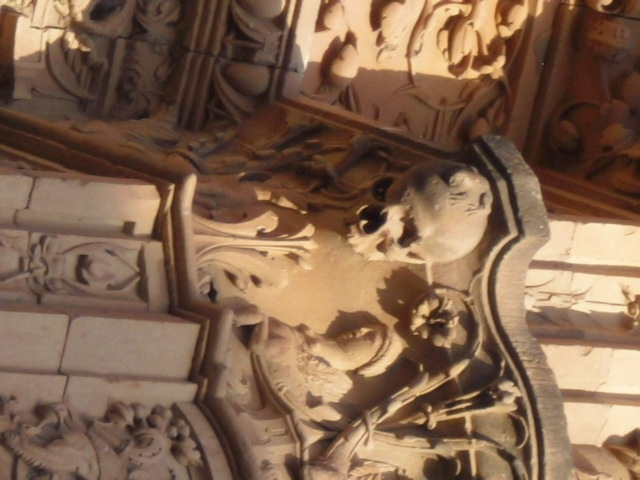 The carved section is about 10 feet wide. The detail is stunning. You can´t help but drop your mouth when you walk into this room. 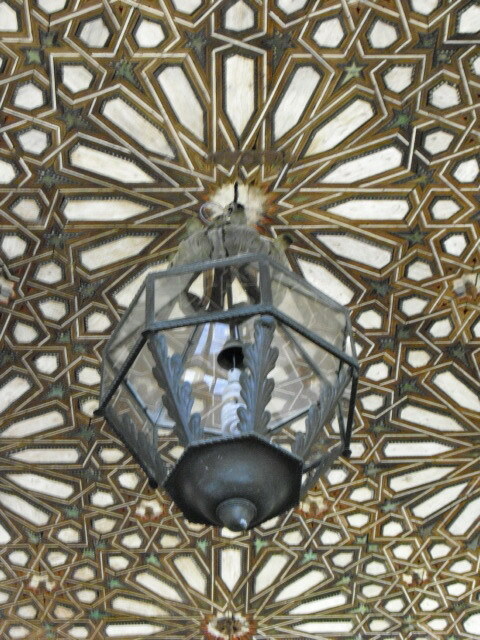 A ceiling of the old library. All hand carved wood. Each color is a different marble or granite. 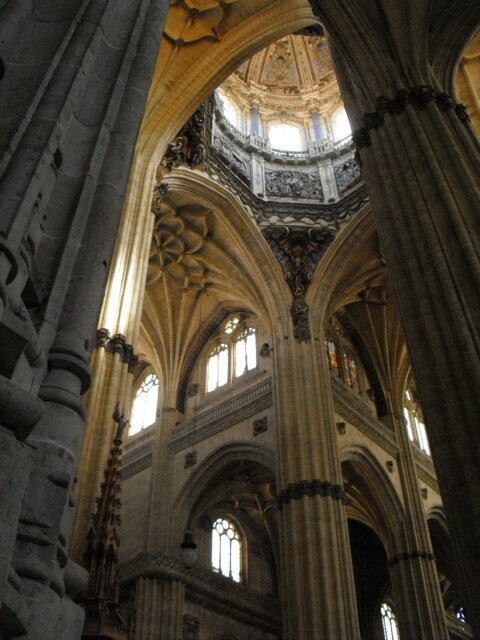 Oh I sooo enjoyed Salamanca and the castle in Segovia. 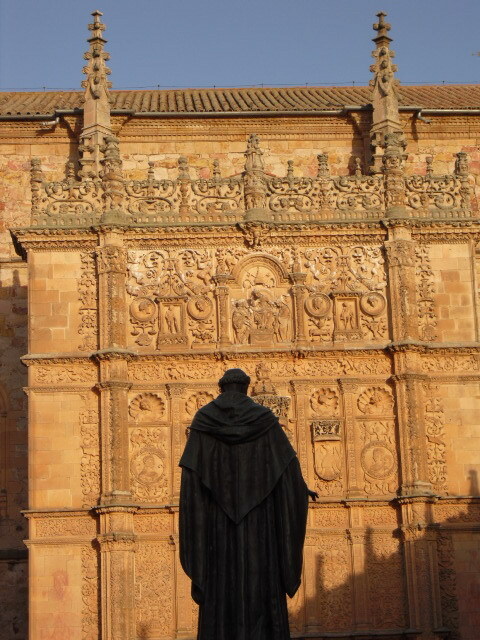 I have a couple pics from Salamanca of the hidden oddities of the architecture like the astronaut. LOL I like that they added humor to the mix. Love the frog idea! Put a picture of a different celebrity in each post! I was thinking about it. Tomorrow when I talk about time management I´ll put up a picture of Angelina Jolie.